Our aging parents sometimes have unmet expectations of their children, like wanting them to become doctors, or visiting and corresponding more, and in an ever growing situations, taking care of them in old age. But when the need for our aging parents to get care and their adult children are not around, this can be disastrous for all parties, both emotionally and financially. Many times, adult children are still taking care of their own kids, and their parents are left with no one to help them around the house or bring them to doctors. This “sandwich generation” is when adult children are taking care of both their children and their parents. In more and more cases, adult children are saving less for their futures as they help pay for their parents’ care and, in a few scenarios, may cut back on work hours or leave a job altogether. In the worse case scenario, discussions about what to do with mom or dad when they need care now or in the future go undiscussed until it is too late. Way too often, aging parents just assume that their adult children will take care of them and their needs, often thinking that one will move in with then in their twilight years. 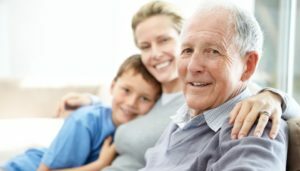 According to a survey conducted by Bay Alarm Medical, more than 55% of parents anticipate their children will be the ones caring for them, either physically or financially, as they age. Unfortunately, most adult children do not agreed with that notion, or know that this is what their parents are thinking. In some areas, like the Midwest, only 36% of people felt children were obligated to care for their aging parents. Participants in other regions of the U.S. were much more likely to say they felt an obligation to caring for their parents in their old age. Parents are three and a half times more likely to lean on their daughters (and expect that of them) than their sons. 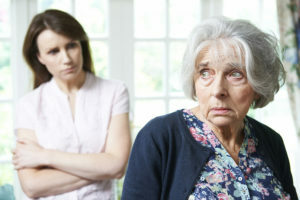 According to a 2006 study on mothers’ expectations of caregiving by their children, and usually rely on the children they feel are closest emotionally. To counter that finding, at Well Beyond Care, we have found that 80% of the adult children using our service as the care administrator and paying for the service, are male. Unfortunately, most families do not discuss caregiving needs, nor most money topics in genreal, because they are so uncomfortable, personal or private. Not only do our aging parents keep their finances hidden, but they sometimes forget or avoid, or just don’t know how, to tell their children what they expect in their old age. The consequences could be a disappointed parent, or one without the proper plan to fund their care, or even worse, a parent who needs care and can not get it. To the consternation of adult children, they end up bearing the brunt financially if they become their parents’ caregiver without planning. The children may not pursue the careers they want because they have to move back home, or they forego putting more money into a retirement account because they think they willl need liquidity for when their parents fall ill.
Communication is vital between the generations in terms of caregiving, estate planning and myriad other reasons and goes a long way to help both generations plan and live without regrets. Begin by getting the entire family together (or at least those most important to planning) and come up with a list of questions or concerns, such as who will provide physical care, do household chores or pay bills. Because this is such an emotionally charged subject (people don’t normally like talking about their declining physical or mental state), children have to be especially patient and empathetic toward their parents, and give them room to get angry when they bring up difficult observations, such as impaired driving abilities. If parents keep resisting the conversation, be persistent and bring it up as many times as necessary. The good news is this that most adult children tend to step up to the plate, even if it is a stressful situation. Of all the 2,000 adult children surveyed in a Merrill Lynch and Age Wave report, 100% said they support their loved ones emotionally and socially, followed by 92% said they provide household support, 84% who said medical support and 64% who said physical care. Another 92% said they provide financial assistance, such as paying the bills, handling insurance claims and cutting back on their own expenses or dipping into their own savings accounts. What is beneficial, is that if a family is unable to move back home, Well Beyond Care can supply a service that saves on average $10,000 to $30,000 over private duty care, and allows management of the care plan from anywhere in the world.